OK, these are over 10 quid but on rare occasions some products are worth a little extra. 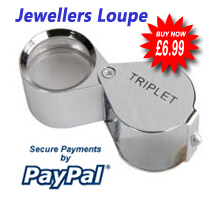 In the case of these you can save nearly £14 by buying them now. Decorative and enchanting, Imageo candle lights are great atmosphere creators. They give off a warm glow with a gentle flicker, but without the risk of open flames and hot wax. 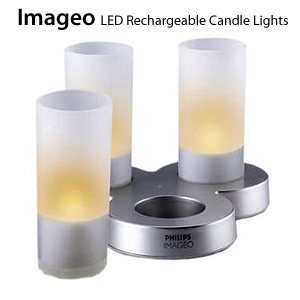 The set includes three rechargeable LED candles in attractive white frosted glass holders. Unlike normal wax candles that eventually burn out, candle lights provide up to 20 hours of light per charge and can be easily recharged. Simply use the induction charger base that doubles as a storage holder when the candles are not in use. Their wireless operation and the fact that they are water resistant allows freedom of placement both indoors and outdoors. These are a great idea, especially if you worry about fires. You can leave them and forget about them. They look great. There's not much point going into the details, as other reviews have done that. I just wanted to say that they really could do with the option of a 'steady glow', as well as the flickering. I found the artificial flickering effect too strong, and not easy to look at. They were okay placed out of the way on a windowsill or something, but next to the TV, or on a dining table in front of you, they were a little irritating. I'm quite sensitive though, so this probably wouldn't be a problem for most people.